This exam guide enables you to install, configure, and manage the vSphere 6.5 infrastructure in all its components: vCenter Server, ESXi hosts, and virtual machines, while helping you to prepare for the industry standard certification. This data center book will assist you in automating administration tasks and enhancing your environment's capabilities. You will begin with an introduction to all aspects related to security, networking, and storage in vSphere 6.5. Next, you will learn about resource management and understand how to back up and restore the vSphere 6.5 infrastructure. As you advance, you will also cover troubleshooting, deployment, availability, and virtual machine management. This is followed by two mock tests that will test your knowledge and challenge your understanding of all the topics included in the exam. 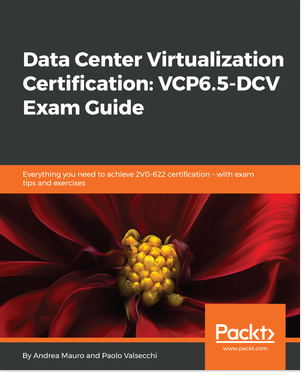 By the end of this book, you will not only have learned about virtualization and its techniques, but you'll also be prepared to pass the VCP6.5-DCV (2V0-622) exam.